Outsourcing Profit Machine ReviewReviewed by David Jenyns on Sep 23Rating: 4.5Outsourcing Profit Machine helps you break free from endless hours of work and lets you concentrate on things that matter most in your business.Are you tired spending all day and night working on your business? If this is the case then it is best to check out my Outsourcing Profit Machine course today. This is perfect for those who need to use the power of internet and take advantage of the leverage it brings to manage and grow your business minus all the stress. You will learn a lot of techniques that has worked for my business starting with attracting and hiring the right people up to managing these outsourced staff to be the best people to help your business grow. Want to know more why this is the best outsourcing course for you? Read my complete Outsourcing Profit Machine to find out more. *Please Note: The Outsourcing Profit Machine Digital Membership is one of our products, but we believe there is no other course online that covers outsourcing to the extent that we cover it. As you can see from the numerous glowing testimonials we have received, this product has changed many businesses for the better. Are You An Overworked Business Owner? Break Free From The Burden Of Micro-Managing Online Marketing. If you’re finding yourself bogged down in your business and are having a tough time increasing your revenue to the next level, chances are it’s because you are micro-managing too much and are not letting all the non-essential tasks (and even some of the essential tasks) to be handled by others. You face the same problem that many other online business owners face – you’re being consumed by your business instead of letting it run like a well-oiled machine. When you have enough help, you can focus on the important things like business strategies and increasing sales. This doesn’t necessarily mean hired help – your best bet is to outsource. Outsourcing works better than hiring employees mainly because you pay based on performance rather than time, and there are no extra expenses like employee benefits and training costs. There are some important tips and tricks to learn when you start outsourcing because if you go about it the wrong way, you’ll be spinning your wheels and wasting a lot of time if you don’t hire the right people who are eager to help you with your business. Our most important workshop to date. What You’ll Learn Through The Course? There is over 7 hours of info-packed content in the Oursourcing Profit Machine Digital Membership. You’ll have access to everything you need to know to build a bigger business, faster and easier than you ever imagined. The workshop participants with Dave, Pete and Ben. How Much Does the Oursourcing Profit Machine Cost? The course is currently discounted at $1697 from the previous cost of $3000. We realize still this is no small investment for some, so we’re willing to back this course with a 100% no questions asked 90 day guarantee. So you can try the course completely risk-free and be on your way to enjoying greater profits while working less. If you want to free yourself from your business, increasing your profits while reducing your workload at the same time, the Outsourcing Profit Machine is definitely worth it. It is made a huge difference for a countless number of businesses, don’t you think that yours should be one of them? Sneak Peak At The Workshop. Want to watch part of the workshop? Here’s a short video about building virtual teams. Still not sure if this is right for you? Find out what business owners and marketers just like you thought of the workshop. 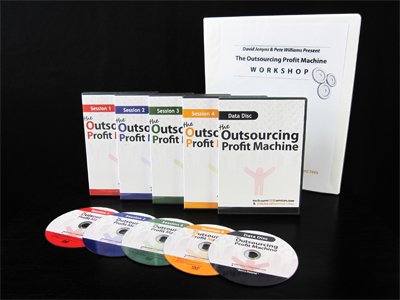 Click below to get the full details of the Outsourcing Profit Machine and how to purchase it.